UA Canada has renewed their support as Presenting Sponsor of the Skills Canada National Competition in 2019, 2020 and 2021. OTTAWA, Ontario, February 6, 2019 – Skills/Compétences Canada (SCC), a not-for-profit organization that actively promotes careers in skilled trades and technologies, is proud to announce that UA Canada, an international Pipe Trades union whose members are the leading professionals in the piping industry, will continue their support as Presenting Sponsor of the next three Skills Canada National Competitions, beginning with the 25th Skills Canada National Competition (SCNC) in 2019, in Halifax, Nova Scotia. “The UA invests heavily in training and recruitment to ensure it is ready for the rapid technological advances happening in the industry and the Skills Canada National Competition represents a great opportunity to engage with Canada’s future workforce. We are proud to be a partner of the 25th Skills Canada National Competition and I look forward to connecting with industry representatives and youth over the course of this great event,” said Larry Slaney, UA’s Director of Canadian Training. 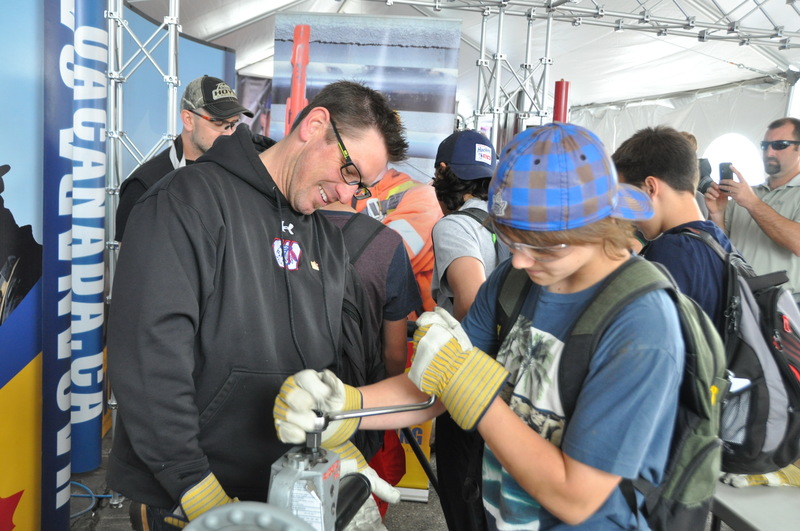 On May 28-29, 2019, labour groups, industry partners, government officials, educators, and youth will gather in Halifax where over 550 students and apprentices will compete in more than 40 skilled trade and technology Skill Areas. SCC is pleased to be working with UA Canada for this year’s competition. UA is an instrumental partner for the construction sector, and they will be onsite to support the following Skill Areas: Plumbing, Welding, Steamfitter/Pipefitter, Sprinkler Systems and Refrigeration and Air conditioning. According to a report from the Canadian Federation of Independent Business, which broke down job vacancies by occupational categories, construction workers are in highest demand, with vacancy rates of 3.7 per cent in Canada. Therefore, employment in the construction sector will continue to be in high demand. “Being involved in the Skills Canada National Competition is a great way for industry partners to educate youth about apprenticeship-based careers. Through our partnership with UA Canada, we are able to raise awareness of the changing landscape of the Canadian job market and the importance of developing the technology/digital skills needed to succeed,” said Shaun Thorson, Chief Executive Officer, Skills/Compétences Canada. The United Association of Journeymen and Apprentices of the Plumbing and Pipefitting Industry of the United States and Canada – commonly known as “UA” – is a union organization whose members are engaged in the fabrication, installation maintenance and servicing of piping systems across North America. Founded in 1889, UA continues to be one of the most respected and influential building trades unions in North America. Its 326,000 highly skilled members belong to over 300 individual local unions. In Canada, the association serves 56,000 members, including over 10,000 apprentices, through 32 local union offices and training centres across the country. UA Canada represents nine major trade classifications including: Steamfitter-Pipefitter, Sprinkler Fitter , Plumber, Metal Trades Workers, Instrumentation Technicians , Welder, Heating Ventilation Air Conditioning and Refrigeration Mechanics, and specialty certified workers in all areas of the piping industry. Visit UACanada.ca to learn more; you can also connect with us on Facebook and Twitter. Its unique position among private and public-sector partners enables it to work toward securing Canada’s future skilled labour needs while helping young people discover rewarding careers. Skills Canada offers experiential learning opportunities including skilled trades and technology competitions for hundreds of thousands of young Canadians through regional, provincial/territorial, national and international events, as well as skilled trades awareness programs. SCC and its member organizations work with the regulatory authorities that administer apprenticeship training for the over 300 skilled trade occupations that are recognized in Canada. Once an apprentice completes their training, they can go on to complete the Red Seal exam, the national standard of excellence, and become a certified journeyperson.